If you don’t pay your full tax liability or fail to file a return, you could face heavy penalties at both the state and federal levels. Even if you can’t pay back the IRS right now, putting it off isn’t the right answer. The longer you wait to address the situation, the more negative consequences you may face. Taxpayers should address tax issues quickly to avoid jail time, steep fines, high interest rates, wage garnishment, and having property confiscated. Interest on tax not paid before the due date. You’ll have to pay interest even if you qualified for an extension. Late filing. If you file your state return late, you’ll have to pay 5% on the tax amount every late month, up to 25%. Late payment. You’ll have to pay a penalty charge of 0.5% of the tax amount for every late month, up to 25%. Erroneous tax calculation. You’ll have to pay 10% of the difference between what you report and what you owe if your tax amount is off by over 10% or $2,000 (whichever amount is higher). Additional penalties for negligent reporting, fraud, and underpayment. You may have noticed the penalty for failing to file is much steeper than the penalty for failing to pay your tax liability. Always file your tax return, even if you’re not sure how you’re going to pay your tax bill. You can always seek professional guidance to find a solution to your tax issues, but failing to file will compound the problems you face with the IRS. Both individuals and businesses can face these penalties. The larger the tax bill, the more impact each penalty can become. Small businesses and individuals can get into financial trouble easily if they fail to prepare and address tax issues quickly. Fortunately, there are several ways individuals can reduce the impact of penalties on their lives. Some people wrongly believe not paying is the best way to avoid penalties, but failing to file or pay leads to more penalties and may also lead to collection actions and other negative consequences. Typically, the IRS is willing to work with individuals who want to address their current situations and avoid similar situations in the future. They offer penalty abatement and tax liability relief options for people who may not have the income or the capital to pay of their debts. Some individuals may qualify for penalty abatement. If you have a valid reason for failing to file or pay your taxes, the IRS is willing to lessen or remove penalties associated with your case. 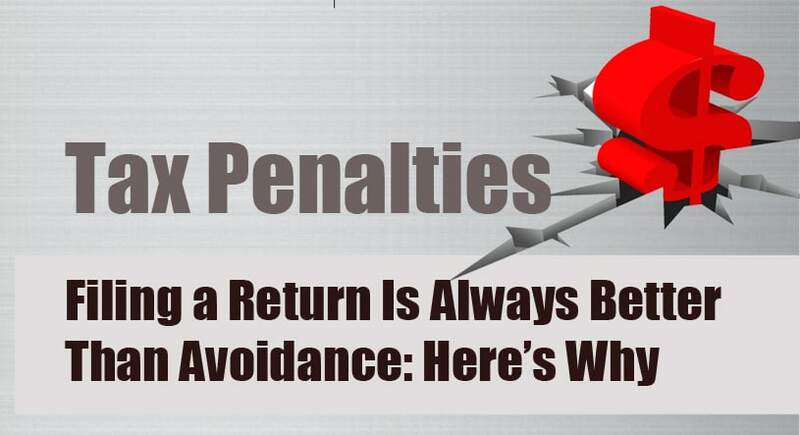 If penalty abatement is not an option, there are other tax relief strategies available. You may qualify for an offer-in-compromise, retrospective deduction, installment agreement, or other relief program. While you can talk with the IRS and navigate the tax code on your own, you may want to seek out a professional before doing so. A credible tax resolution professional has the tax code expertise and the resource network to help find the best strategy for your personal or business tax issues. Whether you disagree with the IRS’s decisions or need help finding a strategy to resolve outstanding tax debt, the professionals at Long Island Tax Resolution Services have a clear process in place to help each individual achieve the best possible outcome. When you contact us for a free initial consultation, we’ll discuss your financial situation and the potential strategies to help decrease penalties and your total debt liability. We’ll then develop a clear approach while providing you with the information you need to make informed decisions. You don’t have to accept every notice from the IRS as the letter of the law. There may be an alternative solution. Contact us today to find out more.